It would stand to reason that white folks in America should be able to take one on the chin every now and then given our American history of bigotry, oppression and otherwise mistreating minorities and non-white natives. We are due a few knocks and jibes. And we don’t necessarily always help ourselves overcome narrow-minded and conservative stereotypes…especially during political season when all you see in the media is a sea of Khaki pants and shirtsleeves. But what I find most interesting is not the degree to which folks of other ethnicities might harbor less than favorable impressions of Caucasians. Rather, I love the degree to which white people like to make fun of themselves…or “other” white people. I also love the light-hearted commentary we see from other facets of mainstream culture that we love to watch in the vein of “it’s funny because it’s true”. I have been observing and enjoying (and in many cases participating in) this emergence of a self-depricating mainstream white culture and acceptance of racial criticism of “white folks”. Sure, it’s funny when we talk about how we can’t dance, jump or take a joke. But given that the “white majority” is soon to become a thing of the past in the U.S. as we grow a truly diverse and rich population, it’s important that we allow ourselves to be properly initiated. It’s almost like we are creating a new tribe of Americans and the “white kids” are being initiated by modified public shaming. This is actually a fairly common tribal cultural tradition to set people straight as they integrate into community life. For example, potty training in some Native American cultures includes allowing your toddler to go to the bathroom outside / in front of everyone and then laughing at them. In some hunting tribes it is customary to berate the quality of a fresh kill to the one who did the deed so as not to allow that person to get a “big head” about their hunting prowess. And so on. I welcome any and all additions to the list to add to my data set. This Narcissistic Anthropologist wants to leave no stone un-thrown as I study the re-initiation of Caucasian Americans s into our modern U.S. culture. Love it. Especially the videos about what white girls say to black girls. I would say that the “public shaming” is *extremely* modified. Having the luxury to poke fun at oneself after having been in power of other groups – and knowing that you will remain in power for the forseeable future – is probably qualitatively different than other groups actual public shaming and sufferings that have occurred. On a lighter note, you definitely point out some great sites and hilarious examples! Yeah, I’m really excited. We are going to be a minority! It’ll be just like being Bengali in Pakistan. It’s a good thing all the other “races” of the world are so much nicer to each other than “whites” are to “non-whites.” This is the best solution ever. You are the smartest anthropologist ever. I bet you must be rich. Or “non-white,” including the strong possibility of being a member of the jewish cult. Are you really that stupid? You make me physically sick. And I bet you won’t even bother to post this because you are a jewish pseudoacademic who is conducting information warefare against the Western world. Quit your job today. Boy do I love a good opposing viewpoint / variation in my data set. Thanks for the very interesting reply! 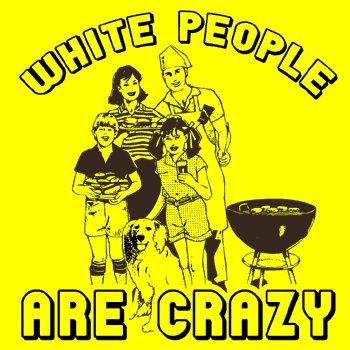 And for the record – I would never assert that “white people” have been the only “race” guilty of oppressing others. Just poking some fun at how silly humans can be…an endless source of material is out there. Thank you for continuing to prove my point on that.